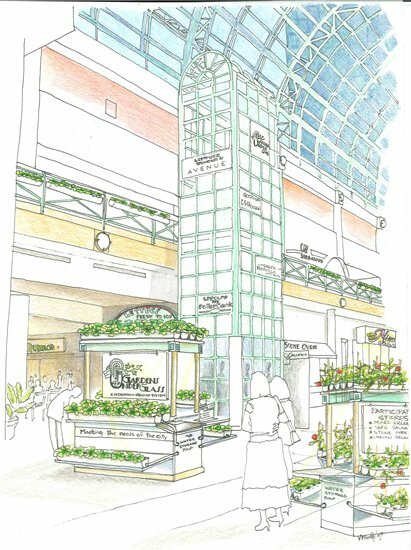 Yesterday, we reported on the Cleveland Galleria mall’s plan to build a massive urban greenhouse where retail shops once stood. The real story, it turns out, is what the two people behind the Gardens Under Glass project have planned for tomorrow. An urban wasteland is being transformed into a green paradise. The idea came about as a way to put some of the mall’s empty space to good use, the Galleria’s marketing and events director Vicky Poole tells FastCompany.com. At its peak, the Galleria had approximately 200 shops. Then the economy tanked. Stores shuttered. A regional bank took over a quarter of the building, the Cleveland Metropolitan Bar Association took over another chunk of space, and much of the rest of the mall was left abandoned. Poole’s first venture into making some extra cash for the mall came 5 years ago when she transformed the food court into an event space for weddings. And then she read an article in Urban Land magazine about vertical farming in cities. “As we run out of land, where can we grow our food? We can utilize empty buildings and empty areas,” she explained. Luckily for Poole, the Galleria has a cool environment with minimal humidity that is perfect for growing lettuces and other greens. So Poole teamed up with Jack Hamilton, the operations manager for Artist Review Today magazine and gallery (located in the Galleria), to get a $30,000 start-up grant for the Gardens Under Glass project from the Civic Innovation Lab. The mall’s management came on board immediately. of a greenhouse and we put up LEDs for natural light,” Poole said. So far so good–the spinach, lettuce, and tomatoes are all growing well, while the strawberries are coming along a bit slower. 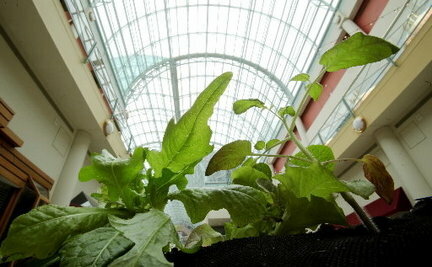 In the next few weeks, the Galleria hopes to install some hydroponic units as well. An order with one hydroponics vendor fell through, so now Poole and Hamilton are searching for another. Eventually, the pair hope to experiment with aquaponics growing methods as well. “Even hydroponically, there are different systems available. So what we plan to do is demonstrate all these systems of growing and at the same time we can see how plants do in different circumstances,” Poole said. 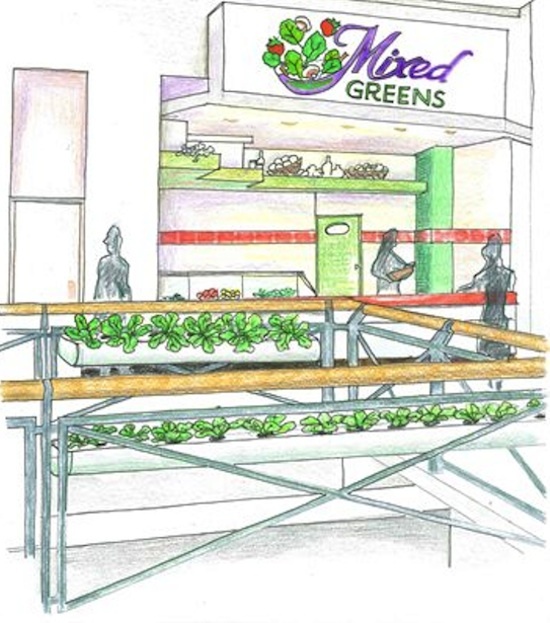 Once the food really starts rolling in, Gardens Under Glass plans to start selling produce to vendors inside the Galleria. “We’ve already had talks with Asia Town (a grocery store) and Cafe Sausalito,” Hamilton said. After that, Hamilton and Poole have an even bigger ambition: turning the Galleria into an urban ecovillage. They hope to attract solar panel companies, health food stores, garden supply companies, vegetarian restaurants and more into the former retail center. It’s a big project, but one that has the potential to educate Cleveland residents about how they can grow their own organic fruits and vegetables. “It’s a feel good message,” Poole said.